Working together in cooperative groups is something this class does very well, so our pumpkin exploration turned out to be a wonderfully fun learning experience! The kiddos practiced the science skills of questioning, predicting and estimating. Recording observations on a data collection sheet allowed us to incorporate math skills as well. We began this enjoyable activity with a lively discussion about their experiences with carving pumpkins and counting seeds. So much excitement! We needed an objective for the investigation, so the children came up with a list of questions. To fine tune the focus of the exploration, we chose the question, "Do pumpkins with longer stems have more seeds?" Before I carved, the children worked on data collection. They counted lines, measured the pumpkins’ height, circumference and the length of each stem. Using tape measures and rulers, they experimented with different ways to measure. Once the cooperative groups completed the data collection, they worked on predicting the number of seeds for each pumpkin. I cut the pumpkins open, and they had a blast scooping out handfuls of pulp and seeds. When all the seeds and pulp were cleaned out, the children estimated how many seeds were in each pile. 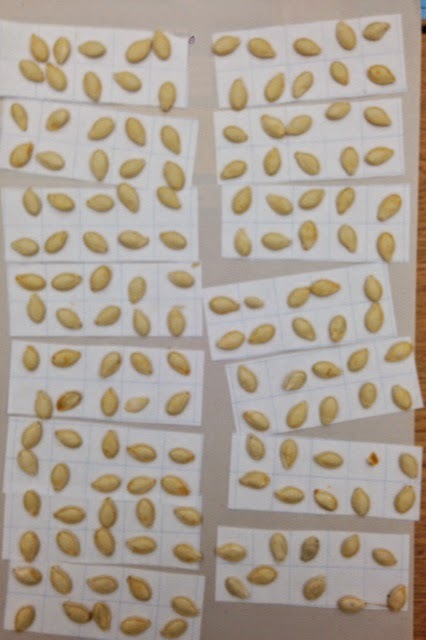 Since the seeds began to dry quickly, the groups went to work counting seeds. One table group was quick to determine the efficiency of counting in groups of ten. Another group found the task a little too challenging, and needed extra help. There were close to 500 seeds in each pumpkin, and I was impressed with the kid’s patience and attention to detail. After I posted their data on chart paper, the groups gathered to discuss our findings. Some of these sweet, little kiddos were disappointed to find the answer to our question was no. But in typical first grade fashion, they recovered quickly and asked if we could carve more pumpkins to find out if bigger pumpkins have more seeds. Another good question! Before we began the cooperative work with the pumpkin exploration, I read this wonderful book to my first graders. The characters - a witch, a ghost, a vampire, and a mummy all try to come up with a way to tug the big pumpkin off the vine. In the end, it's a tiny bat who comes up with the solution. What a great book for teaching cooperative behavior! Thanksgiving is for Giving Thanks!